Chung Yoo-ra, the daughter of President Park Geun-hye’s embattled confidante Choi Soon-sil, was illegally admitted to a prestigious university in Seoul and was given special treatment after enrollment, the Education Ministry confirmed Friday. Releasing the result of its audit of Ewha Womans University, the ministry said that it would request law enforcement authorities to launch a criminal investigation into Chung, her mother, the college’s former president, faculty members and officials. 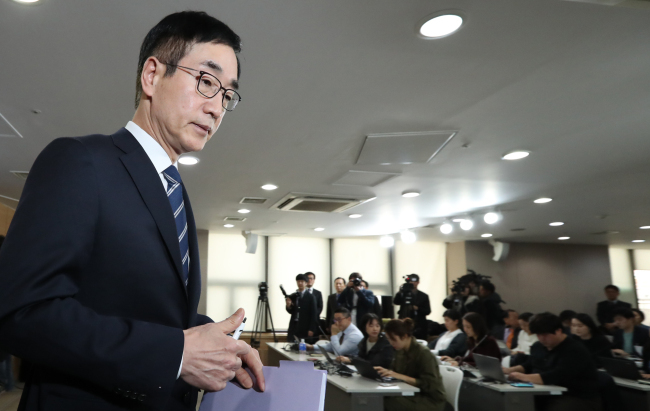 “Since Chung herself played a part in the irregularities, her admission to the university may as well be canceled,” Education Minister Lee Jun-shik told a press briefing. The university, which had previously firmly denied the allegations regarding Chung, issued a public apology and said it would annul her acceptance. The 19-year-old dressage rider is currently in Germany where she stayed with her mother Choi, before Choi returned to Korea late last month to face investigation. Choi is a key figure in a political scandal ensnaring President Park, accused of meddling in state affairs and influence-peddling. She is also alleged to have pulled strings behind the scenes to get her daughter special treatment in educational and sports circles. According to the ministry’s findings, the university added horseback riding to a list of categories open to student athletes in 2014, right before Chung’s admission in 2015. It then considered the 2014 Asian Games gold medal she obtained after the application deadline in the admission process. A chief in charge of admissions ordered interviewers to select “a person who brings a gold medal,” although its policy bans candidates from presenting such items during interviews. Chung was the only candidate who brought a medal. The audit also found that the interviewers had given other students lower scores to help Chung gain admission. While attending the university, Chung was given overly generous marks despite not attending classes, taking exams and turning in assignments. The probe found that in eight of school courses she took, she didn’t attend the classes even once, take exams or turn in assignments but was given generous grades. In one case, the professor did Chung’s assignment on her behalf and gave her marks. The ministry also detected signs that in other courses, someone else took exams and classes for Chung. The Education Ministry conducted the inspection for 16 days, questioning 118 faculty members and students. But it did not grill Choi, Chung and the former Ewha president. It said that it could not confirm allegations that Ewha Womans University won eight of nine state-led projects in return for providing special treatment to Chung. In the coming weeks, prosecutors are expected to investigate whether Choi peddled influence over the university in the process of accepting Chung and granting state-led projects to the university. A separate inspection by the Seoul Metropolitan Office of Education also found that Chung’s middle and high schools gave her favors in attendance and grading. She was able to graduate from high school though she only attended 17 days out of the 193 days in her senior year at Chungdam High School. Her mother Choi offered kickbacks to teachers on three occasions. She also verbally abused and publicly humiliated Chung’s teachers, threatening to fire them, according to the investigation. She was then the wife of her ex-husband Jeong Yoon-hoe, who was a presidential aide. State prosecutors investigating Choi on abuse of power and fraud have questioned high ranking officials from Samsung Group, Chung‘s corporate sponsor, to see if any shady deal was made between the conglomerate and Choi.